ellie etc: Oops, I've been shopping again! Oops, I've been shopping again! Anyway, back to sanity. I've been absolutely drowning in college work recently, hence the posts being thin on the ground. I hopefully will have a few guest posts coming up for you lovely followers, just until I get my feet back on the ground after all this revision and exam business. If any of you would like to do a guest post for me, please don't hesitate to drop me an email! So back to all this shopping I've been doing. As you can see I've got me some more black boots, and that I've also been raiding the stock of Next2Nowt (if you haven't already check it out now, it's amazing!). The crop top was such a bargain for £9.99, I can't believe it. I absolutely adore the print, it's so unique and looks much more expensive than I was hahaha! I can't seem to find it on the website though, so sorry about that. The jumper is gorgeously soft and cosy, but also quite thin so it's nice to wear on slightly warmer days too. I've recently discovered a love for hoop earrings and I'm not really sure why. Personally I think these Monsoon pair are quite tasteful and elegant, I can't stop wearing them! Adding to my jewellery collection as well was this gorgeous neon yellow necklace. I had my eye on it when it was in the shops, so when I saw it on eBay I had to snap it up! 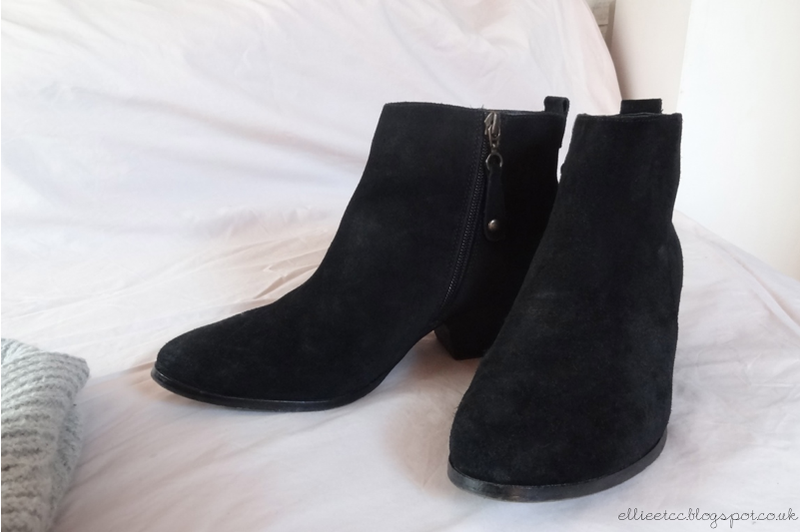 These boots are very similar to those in my haul from a whole ago (here), but with a smaller heel so they a lot better for everyday use. They're suede so I'm going to have to chose the days I wear them wisely to avoid the rain ruining them! They were another bargain at only £28 when they're originally £62?! If any of you follow me on Instagram you will already have seen a picture of these nail polishes. I feel I've been missing out all this time, so I finally got some Topshop nail varnishes - and they do not disappoint! I'm tying to trick myself into thinking it's warmer than it is by getting these bright colours, but I'm not sure if it's working. The orange shade is actually a bit brighter than it looks in the picture. The 'Flamingo Coral' shade is being elusive on the Topshop website as well, so no direct link for that either I'm afraid. Have any of you been shopping recently? (I'm sure you have!) Grabbed any bargains or bought anything lovely? Let me know, I'd love to hear. Also FOR THIS WEEK ONLY, get a whopping 25% off Motel Rocks with my code 'ellieetc' - go grab yourselves something pretty!